Britannia has four Hotels in Blackpool, the Savoy, the Metropole, the Grand Hotel Blackpool and the Norbreck Castle Hotel that are all located close to the main attractions in Blackpool such as The Pleasure Beach, Pier and beaches that millions of people flock to each year. The accommodation at our Blackpool Hotels is perfect for bed and breakfast, short break stays and family seaside holidays. Blackpool is famous for its busy tourist areas, lively night life and family attractions. Although the Summer months are the busiest, there is always something to do all year around, so why not book today at one of our Blackpool Seafront Hotels that offfer value for money accommodation in a super location? When booking a holiday, short break, bed and breakfast or weekend stay with Britannia, guests are always guaranteed to get the best deal – we also cater for group bookings and families, book online direct or check our prices against the local hotels, guest houses and B&Bs. 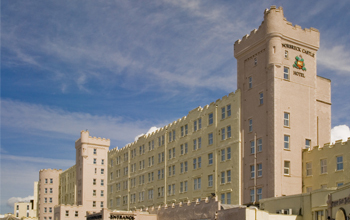 The four Britannia Blackpool Hotels are close to the beach front and have exceptional facilities including free Wi-Fi, sea view rooms and live entertainment; not to mention the restaurants and bars serving up tasty food and refreshing drinks.